The Competent Persons Scheme is a trade body run by the electrical, plumbing and gas industries to provide confidence in the trades each body represents. We talk to a specialist in electrical installations services in London, who was convinced to embrace the new body. He works for My London Builders, and has done for a number of years. The idea behind the Competent Persons Scheme is to allow members to self-certify their work. By providing a minimum quality framework, building inspectors could be confident that scheme members provided services of a high enough quality to not need inspection. The scheme was introduced by the Department of the Environment, Transport and the Regions in the nineties in order to lower the burden on the building inspectors. Members could self-certify their work, negating the need to notify planning of changes and have the work inspected. So, our specialist in electrical installations services in London, could undertake work in his area of expertise, and as a member of the Competent Persons Scheme, could certify his own work as safe. This saved a lot of time and paperwork for both the client and My London Builders. What ever you need, any type of building work, can be done fast, efficiently and for sensible price. We can provide free estimates. Book your estimate now. Just dial 020 8829 0458 and one of our assistants will answer all your questions. Whould you like find out more about our services? We have experienced specialists in any type of building works! If you want to find out more about how we could improve your home and pricing please send your question over email and we would be more than happy to answer. Dave from the firm comments on the scheme. “Originally, I thought the last thing we needed was another trade body that didn’t mean anything. Look at the Guild of Master Craftsmen, a nice logo, a lot of rules, but no inspection or enforcement. It convinced some customers, but not others, and it did nothing to kick the cowboys out. 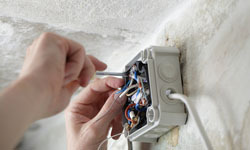 “As I saw a few local electricians sign up, I thought I might look at it again. If nothing else, it was another convincer to have on the side of the van and on the bottom of invoices. It would make the customer feel safe. As it turned out, the scheme seems to be working okay. While the intention wasn’t to use the scheme to drum up new business, it is a nice bonus. In these hard times, trades need all the help they can get. I’m not sure electrical installations services in London are as hard up as Dave makes out, but every trade deserves a break. From a customer perspective, as long as the Competent Persons Scheme is properly run, policed effectively and standards are rigorously enforced for members it is only good news. The construction industry if full of regulators, some more effective than others, and confidence in them is low. This Competent Persons Scheme has to show without doubt that it is in charge and that it keeps standards high. It also has to work hard to keep the cowboys out and publicise the work it does. Otherwise is will become just another logo taking up real estate on the side of vans in the capital. If you’re looking for tradesmen you can trust, call My London Builders. They won’t let you down.